This article was originally published on MMORPG.com. Soulbound Studios announced the hiring of Adam "Snipehunter" Maxwell as the Lead Designer on Chronicles of Elyria. We sat down with the former Rift, Star Citizen, and Revival game maker to chat about what he's bringing to the table for Soulbound's premiere MMORPG. MMORPG: Hi Adam! Long-time no chat! When did you sign on with the Chronicles of Elyria team, and what drew you to the project? Maxwell: I started the second week of October this year! Jeromy and I began exchanging a few emails back in July, but this really came together over the last month or so. I must admit that I've been stalking Chronicles of Elyria since the Kickstarter, though. Even back then, CoE felt like it could deliver on the MMO dream of a true multiplayer evolving online world and realizing that dream has been a passion of mine. I've wanted to be involved from basically the second I saw it. It's honestly a little surreal that I've got the chance now! MMORPG: What will be your role on the team? Your day to day? Maxwell: As a Lead Designer, I am a mentor for the designers on the team, another able hand to help realize Jeromy's design vision, and a sort of “prophet” for that vision, helping to flesh out the technical details and manage our efforts for building it all. MMORPG: You've been on a number of teams, from Rift to Star Citizen, to the anticipated but ultimately canceled Revival. What lessons have you learned from the successful and not so successful MMOs you've been a part of that you'll bring into CoE? Maxwell: Every project I've been lucky enough to be a part of contained its own set of challenges and problems, from Rift's dynamic content systems to Revival's deep simulations, and those challenges each had unique solutions we had to find. That experience brings with it a pretty big bag of tricks and life lessons that I hope I can share with the team here so we can steer through the shoals of our own challenges more easily. MMORPG: It seems to a lot of folks, that MMORPGs are always worried a bit too much about trying to be everything to everyone all at once, rather than trying to establish a good core game that sticks with people - and then expand on it as a live service. How will CoE avoid the temptation for feature creep? Maxwell: Part of the problem with feature creep is that it dilutes a game's vision and this is most obvious when a game's central vision is weak or muddy to begin with. If that vision isn't clear, adding new features seems like a way to bring that vision into focus, and that can work but, most often, it's a trap that sinks a game and makes its vision harder to see rather than easier. I'm still new here but I don't see CoE as having that problem. The world of Elyria is well-defined and its vision is clear. Avoiding feature creep is easy when you can see the goal as clearly as everyone here does. MMORPG: One of the things you worked on was the Virtual Dungeon Master system for Revival. Will you be imparting something like that into COE? Maxwell: The Soulborn Engine has a vDM analog of its own so, in that regard, it's more about sharing what I've learned from Revival's approach than it is starting from scratch. Honestly, half my fun getting to know everyone here has been in asking questions like “so how did you all handle...” and then randomly picking a feature from Revival. Weather, NPC memory, narrative dynamics...every answer is different from Revival but they always hit the same mechanical goal. I feel like the two projects are siblings separated at birth. It's both awesome and eerie at the same time. MMORPG: How are you and the rest of the team approaching world building and Lore, given that Jeromy Walsh has a richly detailed roadmap of what's in Elyria and what makes sense for the world? How do you translate that to a fun and compelling place to play? Maxwell: I can't speak for everyone, but I honestly find that constraints breed creativity, so I find having such clear vision makes it a lot easier to translate those constraints into good gameplay. The team here runs like a performance engine though, so I suspect they agree. As I write this we're planning the next week's work and everyone seems laser focused on realizing Jeromy's plan. There's a lot of back and forth where we nail down details for those goals. Once we are all on the same page we know our work is on-point and the constraints act as guide posts on the way rather than walls in our path. MMORPG: Elyria has a unique challenge - it's aiming to make a world that changes and ages over time, heroes that grow old and die. We can only assume that you wowed Soulbound with ideas on how to make this work. How do you envision the players’ impacting the direction of the world actually working in-game? Maxwell: Heh! I hope I wowed them but honestly, in my case, they wowed me. I mentioned it earlier, but it is huge fun for me to see the differences in approach between how this team works toward the goal and how my own efforts worked in the past. Sharing those differences here has led to some interesting conversations. In the case of player impact though? Well, at the risk of oversimplification, things will work much the way they do here in reality: the world and its inhabitants have their own memories and form opinions and make inferences based on them. If players want to live unremarkable lives they will still impact the world around them through those memories and opinions, though the scope of that impact – both regionally and temporally – might attenuate more quickly depending on how one is viewed by those around them. MMORPG: When can we expect to start seeing some playable single player versions, as backers? And what's your first goal as the Lead Designer? Maxwell: I'm still pretty new here, so my goal for the moment is to just be of use. But I honestly want what Jeromy does: Realizing an evolving online world. As for backers getting their hands on the game? We’re working towards getting VoxElyria into the hands of our alpha backers by the end of the year, so we're developing multi-player systems now, rather than single-player experiences. It's an amazing team and everyone here is working to bring the community an incredible experience. I can't wait 'till we can show it off! Nice to see the studio continually evolving as does the game! Great. Now I feel the sudden need to rebuild Crown’s Rock in Elyria. Great. Now I feel the sudden need to rebuild Crown’s Rock in Elyria. Welcome (back) Snipe! 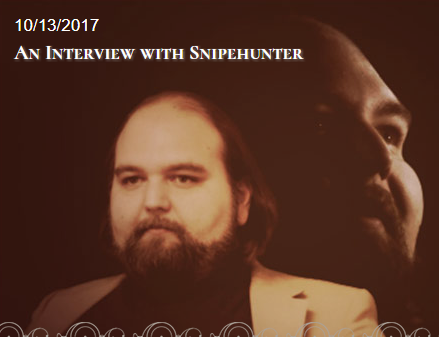 Snipehunter, OMG. The systems you articulated for Revival were everything I wanted an MMO to be. I have read those design blogs a dozen times. Win for you, win for CoE, win for all of us. I need playable version now! Welcome to the CoE community! Posted By **Snipehunter** at 07:44 AM - Tue Oct 17 2017 > > Posted By **Maulvorn** at 3:38 PM - Sat Oct 14 2017 > > > > > Something I found on the discord ( I didn't make it) > > > > ! (https://media.discordapp.net/attachments/258394797054754826/368878548141998090/unknown.png) > > I figured if I supplied something ridiculous enough, I could escape undocumented. I clearly have not yet found the threshold for "ridiculous enough." ;) Welcome to the CoE community! Awesome to see you join the CoE team and community! Looking forward to more insight into your role within the studio in our next quest updates. Welcome! It's great hearing from any one new and old on the team. Rubbed her hands together and let out a wicked little giggle Mahhaaahaha. A new victim to abuse! now I am a little bit worried. Posted By **Govolex** at 4:28 PM - Fri Oct 13 2017 > > now I am a little bit worried. Out of curiosity, why? two of the three projects he has worked on are dead or rubbish. Posted By **Marovec** at 3:53 PM - Mon Oct 16 2017 > > Posted By **Govolex** at 4:28 PM - Fri Oct 13 2017 > > > > > now I am a little bit worried. > > Out of curiosity, why? two of the three projects he has worked on are dead or rubbish. Well, I enjoyed Rift, until it became obsessed with micro-transactions like so many other games (I doubt he has anything to do with that, as that is a business decision), SC looks gorgeous, and people simply love to hate on it because of the time taking to release (so not sure how that relates to him), and I don't know what Revival is. So...maybe you are right on 1 out of 3? I would need to research more about Revival and see why it failed. I don't know, maybe you are just that guy trying to stir up drama, or you like to think that because he worked on those games, he is 100% responsible for their fate? I hate people like you that take a sentence and distort it to make people say what they are not. I only said i am a litte bit worried not that e is 100% responsible for their faith. besides, SC may look gorgeous but after more than 5 years is only a tech demo of a game. A lot of wonderfull trailers but when you launch the "game" it is rubbish even for a tech demo. Posted By **Marovec** at 3:57 PM - Tue Oct 17 2017 > > Posted By **Govolex** at 08:48 AM - Tue Oct 17 2017 > > > > > Posted By **Marovec** at 3:53 PM - Mon Oct 16 2017 > > > > > > > > Posted By **Govolex** at 4:28 PM - Fri Oct 13 2017 > > > > > > > > > > > now I am a little bit worried. > > > > > > Out of curiosity, why? > > > > two of the three projects he has worked on are dead or rubbish. > > Well, I enjoyed Rift, until it became obsessed with micro-transactions like so many other games (I doubt he has anything to do with that, as that is a business decision), SC looks gorgeous, and people simply love to hate on it because of the time taking to release (so not sure how that relates to him), and I don't know what Revival is. > > So...maybe you are right on 1 out of 3? I would need to research more about Revival and see why it failed. > > I don't know, maybe you are just that guy trying to stir up drama, or you like to think that because he worked on those games, he is 100% responsible for their fate? > > *shrug* > > Up to you I guess... I hate people like you that take a sentence and distort it to make people say what they are not. I only said i am a litte bit worried not that e is 100% responsible for their faith. besides, SC may look gorgeous but after more than 5 years is only a tech demo of a game. A lot of wonderfull trailers but when you launch the "game" it is rubbish even for a tech demo. Welcome, Snipehunter and to the CoE community. It is a pleasure to see the Soulbound team grow in number. Welcome, Snipehunter and to the CoE community. It is a pleasure to see the Soulbound team grow in number. on behalf of the Kingdom of Bordweall, welcome to the community! @Snipehunter on behalf of the Kingdom of Bordweall, welcome to the community!